Spotify reaches 50 millions paid users, SnapChat launches its IPO and Uber’s plans to create an in ride content marketplace. 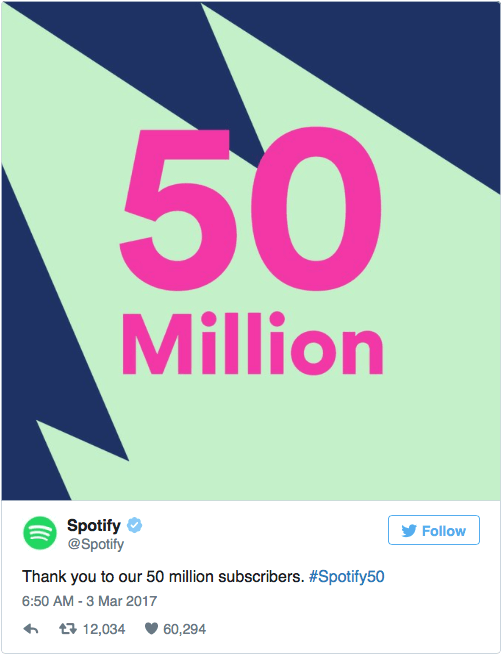 On the 3rd of March, Spotify announced that it had reached the milestone of attaining 50 million paid subscribers. This is a first within the music streaming space as its nearest competitor, Apple Music, is tracking along with 20 million paid users. At the beginning of February, Spotify announced that it was partnering with the New York Times in a deal that saw new digital subscribers to its publication – who sign up for a yearly commitment subscription – receiving unlimited access to Spotify Premium. Could this form of collaboration between subscription-based services become a new growth strategy for all your favourite applications? We’ve seen similar deals in the past from Apple Music as they partner with telecommunication companies to offer free subscriptions to their services. In any regard, the collaboration was a smart play on Spotify’s behalf as they continue to lead the market. It was the IPO that everyone was talking about. After all of the anticipation, SnapChat’s (Snap Inc) IPO officially launched. With shares originally pricing at $17, the stock closed at $24.48 the following day. That’s an immense increase of 44%. Throughout its first day of trading, Snap surely wasn’t shy of making headlines with the announcement that NBCUniversal invested $500 million in the company as a strategic partnership. After only one day into it’s listing, Snap was already worth more these nine major public companies. However as they say, all good things must come to an end. After the two-day victory streak in the market, Snaps stock dropped back down to the $22 mark. As always, it’s refreshing to see tech companies publicly list themselves. Although SnapChat is faced with new competitors within its marketplace, launching its IPO can be seen as a sign of growth and stability for the company. Uber is planning to launch what looks like could be the next big step for the companies revenue growth. But what exactly will be on offer for content marketers? Uber plans to incorporate ways to enable users to engage in special SnapChat filters, photos of their destinations via Instagram and car pooling capabilities through mutual friends on Facebook. This exciting news could bring an end to boring car trips or awkward conversations with drivers. What do you think about the new concept? Would this encourage you to use Uber’s services more frequently? Let us know by tweeting us at@hydricmedia.